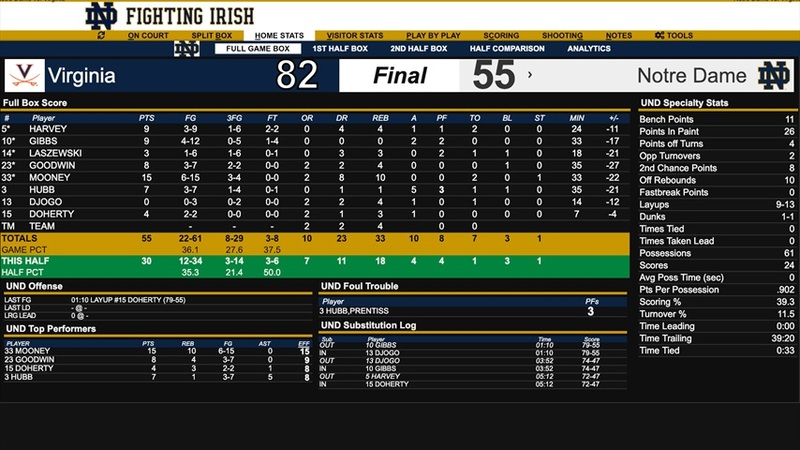 Notre Dame’s (11-9, 1-6) offense was silenced by Virginia’s (18-1,6-1) top-ranked defense and was defeated 82-55 on Saturday at Purcell Pavilion. TJ Gibbs opened the second half with a quick bucket to give the Irish the first points of the second half, but the Cavaliers countered with three straight buckets by Ty Jerome and Hunter to extend their lead to 21, 48-27. However moments later, sparked by back to back three-pointers by John Mooney, Notre Dame started to clip into Virginia’s lead. De’Andre Hunter matched Mooney’s three-pointers with back to back layups, but DJ Harvey found a burst of offense and scored five unanswered points with just under 14 minutes left in the game to cut the lead to just 12, 54-42. 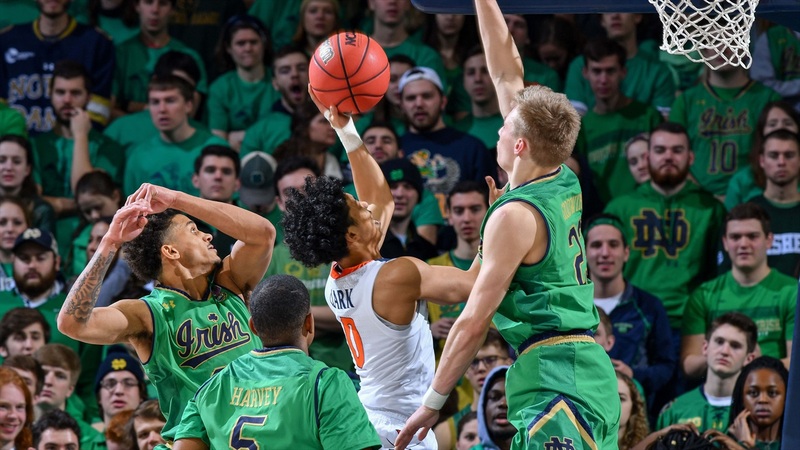 The offensive output for the Irish didn’t last long and Virginia continued to roll when Mamadi Diakite and Jerome were put back into the game after a short rest. The Cavaliers went onto an 11-2 run sparked by a few blocks by Diakite and offensive rebounds by the team as a whole which created more chances on the offensive end. “That’s was flat out men versus boys,” stated Brey. “We were very impressed with Virginia and they took our spirit. We couldn’t get into an offensive rhythm and it affected us defensively and our fight, which was disappointing. We played discouraged. We were hoping we could be competitive. Despite the rough offensive game for Notre Dame, only shooting 36 percent from the field, Mooney recorded his sixth consecutive double-double with 15 points and 10 rebounds. Harvey and Gibbs also added nine points. Freshman Chris Doherty also scored his first collegiate points. Virginia shot 52 percent from the field and only turned the ball over twice. The Cavaliers also outrebounded the Irish 45 to 32. Virginia had four guys score in double figures. Hunter led the way with 19 points and seven rebounds. Jerome did it all with 13 points, nine rebounds and six assists. Kyle Guy and Diakite added 15 and 10 points respectively. Diakite added four blocks and seven rebounds. Offensively, Notre Dame couldn’t get into a rhythm and couldn’t match Virginia’s efficiency. Whenever the Irish got a bucket or two, the Cavaliers matched them with a quick burst of offense of their own. Virginia led Notre Dame by 17 going into the halftime, 42-25. Notre Dame started the game on a massive offensive drought. Virginia took advantage of Notre Dame’s cold shooting and started the game on a 12-0 run, sparked by three buckets by Diakite. The Irish missed their first nine shots until Mooney muscled his way in the paint for a tough layup with 13:35 left in the first half. 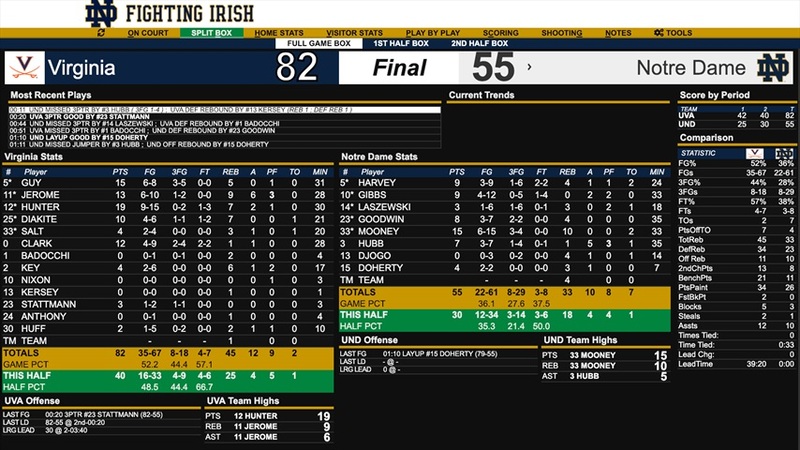 The Irish tried to get back into the game when Harvey countered Mooney’s bucket with a jumper of his own for a quick four-point swing in favor of Notre Dame, but Virginia hit its next six field goals and outscored the Irish, 11-3. The Cavaliers led 23-7. Notre Dame shot a miserable 37 percent from the field. Dane Goodwin led the Irish in scoring with eight points. Mooney also added seven points and six rebounds. Goodwin’s offense came within the last few minutes of the first half when he hit a couple three-pointers. Virginia shot 56 percent from the field and hit four of their nine attempts from long range. Guy led the way with 15 points on six of seven shooting. Hunter also added 10 points for the Cavaliers. A big reason for their success was good defense and taking care of the basketball. Virginia only turned the ball over once, while Notre Dame turned the ball over six times.